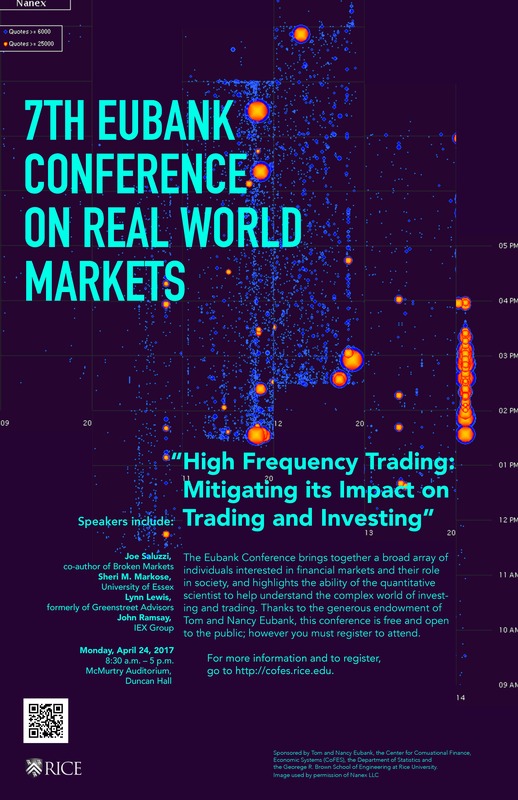 7th Eubank Conference on Real World Markets: High Frequency Trading; Mitigating its Impact on Trading and Investing. Join us as we again bring together thought-leaders, practitioners and innovators to discuss the changing structure of financial markets and how quantitative scientists can assist with understanding and navigating this change. The theme of this year’s conference is “High Frequency Trading: Mitigating its Impact on Trading and Investing.” Due to the generosity of our benefactors and sponsors, there is no cost for this conference, but registration is required. The conference committee is pleased to again bring forward two short courses in conjunction with the conference. Although there is a small registration fee for these courses, the primary cost of the short courses is offset by the generous support of our sponsors. Onsite registration is now also available!